Rail services are being affected in and out of Glasgow Queen Street station after a person was hit a train. 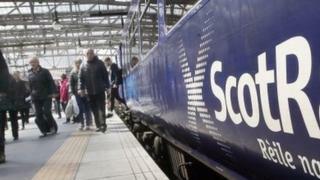 ScotRail said the line to Bellgrove in the east end of the city had been blocked following an incident at about 06:30. A number of trains between Glasgow and Cumbernauld via Falkirk and services to Helensburgh have been disrupted. Commuters are being advised to use their rail tickets on buses and the Subway. A statement on ScotRail's website said: "The emergency services are dealing with an incident between Queen St and Bellgrove and unfortunately that means we can't run trains as the line is currently blocked. "We're working closely with the emergency services to get the line reopen, but we've no estimate for this at present." A British Transport Police spokeswoman said: "Shortly after 6.30am today, officers were called to the line close to Bellgrove station following a report of a person being struck by a train. "Colleagues from the ambulance service also attended, however a person was sadly pronounced dead at the scene. "Officers are working to inform their family and making enquiries into how they came to be on the tracks."